Sun Prairie, Wisconsin based Badger Image Group (BIG) has been delivering innovative print and mail solutions for over a decade. Building on a combination of engaging creative services and an impressive technology fleet, BIG recently increased their capabilities with the addition of the AccurioJet KM-1 UV inkjet press. The OutputLinks Communications Group had the pleasure of speaking with Dean Gille and Mike Henning, Co-owners about their expanding business and the new opportunities it is bringing to their valued clients. Badger Image Group builds their capabilities – from the technology they acquire to the production processes they design - to meet their clients’ needs and continue to raise the bar. The company’s efforts are focused on supporting and enhancing their client's brand. BIG utilizes their creative talent and leading technology to deliver compelling graphic communications which include both traditional and specialty output. Developing new customers is essential, but BIG invests as much or more energy in supporting long-term, trusted client relationships. A significant portion of BIGs’ client base has been with them for twenty years or more. The BIG team focuses on developing and fostering strong client relationships. The awareness and value-added solutions to each client’s business needs have resulted in a virtual integration of BIG with their business vision. Everyone at BIG understands the client’s brand and strategy for every project. This approach ensures it is done right through every step of the process. Each team member has the capability and talent to act as a liaison to our client's marketing department. The objective is to help translate the client’s business vision into their persona branded output. Dean states, "We are a growing company. Our people see that, and it drives our mission. They care about our customers and understand our customer's needs. If something does not look right to the team, production stops and the client is engaged in identifying resolution. Our clients are impressed by the attention to detail and exceeding our customers’ expectations." Customers appreciate our team’s commitment. One customer delivered a cherished compliment saying, "Your process works so well with our team that we are trying to train our other vendors to do what you guys do." Badger Image Group understands that a successful business strategy includes a technology roadmap for the systems and processes required to meet and exceed client quality, cost and time expectations. To accomplish their technology roadmap, BIG has invested in traditional offset technology integrated with the latest in digital print capabilities. 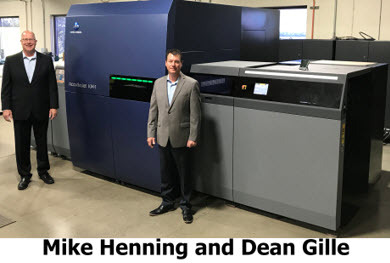 As Dean and Mike studied the value digital printers might bring their clients, they determined that production inkjet should be the next step in their technology roadmap. As a high-volume operation with good experience in digital print, they applied their knowledge to the evaluation of inkjet systems including offerings from multiple vendors. The BIG team was well on the way towards making a final decision when a suggestion from a colleague printer led them to take a close look at the AccurioJet KM-1. Upon further investigation, BIG narrowed the choice to the AccurioJet KM-1 and one other finalist. Both vendors we asked to do a time study analysis on production output. After carefully analyzing the results, the BIG team determined that the speed, 23” x 29” sheet size and extensive features, including UV ink and automatic duplexing, gave the AccurioJet KM-1 a clear and significant advantage over the competitor- who had bid a lower cost! Dean identifies several of the key attributes that made the AccurioJet KM-1 the right choice for BIG and its clients. On all fronts, the Konica Minolta team delivered. From the first sales discussion through the testing and evaluation process, the AccurioJet team worked with BIG to understand their entire operation. In so doing, they delivered additional value in technical and production expertise to help BIG prosper with their new inkjet press. Moreover, when any issues arise, the Konica Minolta response is thorough and immediate. The Konica Minolta team came to the engagement with the same sense of commitment and partnership that Badger Image Group brings to their clients. They focused on what makes BIG unique and offered not only a breakthrough piece of technology, but a depth of industry experience and a service and support capability that far exceeded any competitive offering. When the BIG operations team did its initial AccurioJet KM-1 production planning, they envisioned only needing to run the system a maximum of 5 hours a day. That plan changed when they realized how the AccurioJet KM-1's productivity, flexibility, and reliability opened the gates to new opportunities to provide their clients an expanded portfolio of print-based offerings. Beyond the enhanced capability, the AccurioJet KM-1’s speed and output flexibility led BIG to identify workflow enhancements that allowed their entire production environment to operate at peak productivity. As a result, Badger has now transitioned into a 5 x 24 operation. With exciting new technology, enhanced workflow and 19 extra hours of production time, Badger Image Group is geared up to utilize this state of the art inkjet digital press and continue fostering success with long-lasting client relationships. “Konica Minolta is excited about our new partnership with Badger Image Group. Mike and Dean have taken the company in a new direction resulting in record growth by investing in the AccurioJet KM-1 and we are proud to be a part of a GREAT SUCCESS STORY. Konica Minolta looks forward to continue growing our partnership for the long term. As the AccurioJet KM-1 provides them the platform to strengthen current customer relationships and develop new customers to their company.” - Bill Troxil, SVP, Strategic Business Development, Konica Minolta Business Solutions.